How Dense is the Asteroid Belt? We’ve seen way too many science fiction episodes that show asteroid belts as dense fields of tumbling boulders. How dense is the asteroid belt, and how to spacecraft survive getting through them? For the purposes of revenue, lazy storytelling, and whatever it is Zak Snyder tells himself to get out of bed in the morning, when it comes to asteroids, Science fiction and video games creators have done something of disservice to your perception of reality. Take a fond trip down sci-fi memory lane, and think about the time someone, possibly you, has had to dogfight or navigate through yet another frakkin’ asteroid belt. Huge space rocks tumbling dangerously in space! Action! Adventure! Only the skilled pilot, with her trusty astromecha-doplis ship can maneuver through the dense cluster of space boulders, dodging this way and that, avoiding certain collision. And then she shoots her pew pew laser breaking up larger asteroids up into smaller ones, possibly obliterating them entirely depending on the cg budget. Inevitably, there’s bobbing and weaving. Pursuit craft will clip their wings on asteroids, spinning off into nearby tango. Some will fly straight into a space boulder. Finally you’ll thread the needle on a pair of asteroids and the last ship of the whatever they’re called clicky clacky mantis Zorak bug people will try and catch you, but he/it won’t be quite so lucky. Poetically getting squashed like… a… bug. Sackhoff for the win, pilot victorious. Okay, you probably knew the laser part is totally fake. I mean, everybody knows you can’t hear sounds in space. Outside of Starbuck being awesome, is that at all realistic? And if so, how does NASA maneuver unmanned spacecraft through that boulder-strewn grand canyon death trap to reach the outer planets? The asteroid belt is a vast region between the orbits of Mars and Jupiter. Our collection of space rocks starts around 300 million kilometers from the Sun and ends around 500 million kilometers. The first asteroid, the dwarf planet Ceres which measures 950 km across, was discovered in 1801, with a “That’s funny.”. Soon after astronomers turned up many more small objects orbiting in this region at the “Oooh neat!” stage. They realized it was a vast belt of material orbiting the Sun, with I suspect a “We’re all gonna die.”. To date, almost half a million asteroids have been discovered, most of which are in the main belt. As mentioned in a another video, gathering up all the material in the asteroid belt and gluing it together makes a mass around 4% of the Moon. So, in case one of your friends gets excited and suggests it was a failed planet, you can bust out that stat and publicly shame them for being so 1996, Goodwill Hunting style. You like asteroids? How about them asteroids? There’s a few hundred larger than 100 km across, and tens of millions of rocks a hundred meters across. Any one of these could ruin a good day, or bring a bad day to a welcome firey close for either a depressed wayfaring spacecraft or a little bluegreen speck of a planet. Which sounds dangerous all the way around. Fortunately, our asteroid belt is a vast region of space. Let’s wind up the perspective-o-meter. If you divide the total number of objects in the field by the volume of space that asteroid belt takes up, each space rock is separated by hundreds of thousands of kilometers. Think of it as gravity’s remarkably spacious zen rock garden. 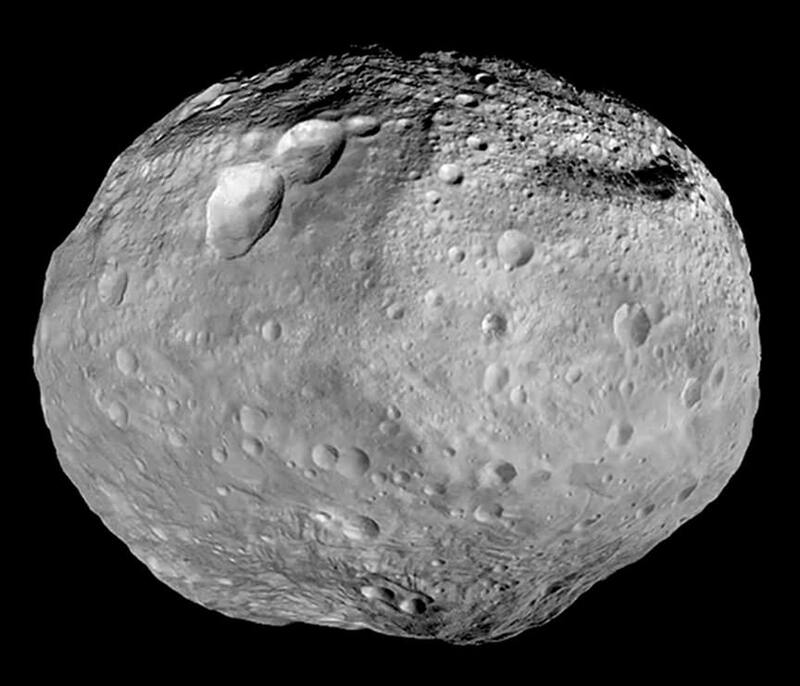 Ceres compared to asteroids visited to date, including Vesta, Dawn’s mapping target in 2011. Image by NASA/ESA. Compiled by Paul Schenck. As a result, when NASA engineers plot a spacecraft’s route through the asteroid belt, they don’t expect to make a close encounter with any asteroids – in fact, they’ll change its flight path to intercept asteroids en route. Because hey look, asteroid! Even though Ceres was discovered in 1801, it’s never been observed up close, until now. NASA’s Dawn spacecraft already visited Asteroid Vesta, and by the time you’re watching this video, it will have captured close-up images of the surface of Ceres. Once again, science fiction creatives sold us out to drama over hard science. If you’re passing through an asteroid belt, you won’t need to dodge and weave to avoid the space rocks. In fact, you probably wouldn’t even know you were passing through a belt at all. You’d have to go way the heck over there to even get a nearby look at one of the bloody things. So we’re safe, our speck is safe, and all the little spacecraft are safe…. for now. Which dramatic version of “asteroids” are you most fond of? Tell us in the comments below. Dawn’s approach and trajectory as it begins its orbital “dance” with Ceres. As you watch, note the timeline at upper right. Dawn made it! After a 14-month tour of the asteroid Vesta and 2 1/2 years en route to Ceres, the spacecraft felt the gentle tug of Ceres gravity and slipped into orbit around the dwarf planet at 6:39 a.m. (CST) Friday morning. “We feel exhilarated,” said lead researcher Chris Russell at the University of California, Los Angeles, after Dawn radioed back the good news. Not only is this humankind’s first probe to orbit a dwarf planet, Dawn is the only spacecraft to fly missions to two different planetary bodies. Dawn’s initial orbit places it 38,000 miles (61,000 km) from Ceres with a view of the opposite side of Ceres from the Sun. That’s why we’ll be seeing photos of the dwarf planet as a crescent for the time being. If you watch the video, you’ll notice that Dawn won’t see Ceres’ fully sunlit hemisphere until early-mid April. The spacecraft will spend the next month gradually spiraling down to Ceres to reach its “survey orbit” of 2,730 miles in April. From there it will train its science camera and visible and infrared mapping spectrometer to gather pictures and data. The leisurely pace of the orbit will allow Dawn to spend more than 37 hours examining Ceres’ dayside per revolution. NASA will continue to lower the spacecraft throughout the year until it reaches its minimum altitude of 235 miles. More about Dawn’s incredible accomplishment can be found in the excellent Dawn Journal, written by Dawn chief engineer and mission director Marc Rayman. Just sit back and watch the world turn… or should I say, watch the dwarf planet turn in this fascinating animation from Dawn as the spacecraft continues on its ion-powered approach to Ceres! The images were captured by Dawn’s framing camera over the course on an hour on Jan. 13 at a distance of 238,000 miles (383,000 km) from Ceres. At 590 miles (950 km) wide Ceres is the largest object in the main asteroid belt. Although these latest 27-pixel images from Dawn aren’t quite yet better than Hubble’s images from Jan. 2004, very soon they will be. Launched Sept. 27, 2007, Dawn previously spent over 13 months in orbit around the asteroid/protoplanet Vesta from 2011–12 and is now on final approach to Ceres. On March 6 Dawn will arrive at Ceres, becoming the first spacecraft to enter orbit around two different target worlds. Learn more at JPL’s Dawn mission site here, and find out where Dawn is right now here. 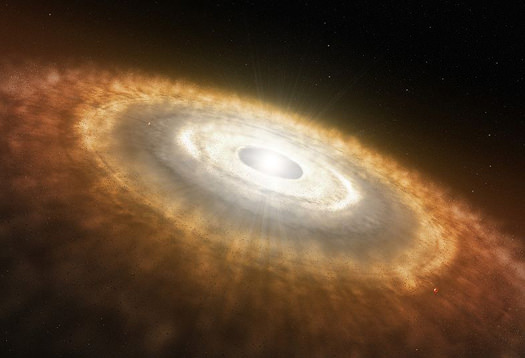 Also, read more from the Max Planck Institute for Solar System Research here. It’s hard to study what an asteroid impact does real-time as you’d need to be looking at the right spot at the right time. So simulations are often the way to go. Here’s a fun idea captured on video — throwing drops of water on to granular particles, similar to what you would find on a beach. The results, the researchers say, look surprisingly similar to “crater morphology”. A quick caution — the similarity isn’t completely perfect. Raindrops are much smaller, and hit the ground at quite a lower speed than you would see an asteroid slam into Earth’s surface. But as the authors explain in a recent abstract, there is enough for them to do high-speed photography and make extrapolations. Although the mechanism of granular impact cratering by solid spheres is well explored, our knowledge on granular impact cratering by liquid drops is still very limited. Here, by combining high-speed photography with high-precision laser profilometry, we investigate liquid-drop impact dynamics on granular surface and monitor the morphology of resulting impact craters. Surprisingly, we find that despite the enormous energy and length difference, granular impact cratering by liquid drops follows the same energy scaling and reproduces the same crater morphology as that of asteroid impact craters. There are of course other ways of understanding how craters are formed. A common one is to look at them in “airless” bodies such as the Moon, Vesta or Ceres — and that latter world will be under extensive study in the next year. NASA’s Dawn spacecraft is en route to the dwarf planet right now and will arrive there in 2015 to provide the first high-resolution views of its surface. Amateurs can even collaborate with professionals in this regard by participating in Cosmoquest, an organization that hosts Moon Mappers, Planet Mappers: Mercury and Asteroid Mappers: Vesta — all examples of bodies in a vacuum with craters on them. The research was presented at the APS Division of Fluid Dynamics annual meeting and published in the Proceedings of the National Academy of Sciences. It was led by Runchen Zhao at the University of Minnesota.